Kenny Florian nick named “KenFlo” is an American mixed martial artist with a strong training background in Brazilian Jiu-Jitsu and Muay Thai. Kenny gained popularity in the sport while he was a contestant on the first season of the Ultimate Fighter where he made it to the season finale and lost the Middleweight championship to fellow training partner Diego Sanchez. Kenny Florian is currently a lightweight MMA fighter fighting in the UFC and is scheduled to face B.J. Penn in his second UFC Lightweight championship bout at UFC 101 in August of 2009. Kenny is widely known in the MMA world for his vicious elbow strikes that UFC commentator Joe Rogan describes as “razor sharp”. Soon after his loss in the TUF season 1 finale to Sanchez, KenFlo was asked to return to the UFC and fight at the first ever Ultimate Fight Night hosted by the UFC. Kenny fought and defeated one of his fellow Ultimate Fighter season 1 fighters Alex Karalexis 3 minutes into the second round with a brutal cut across Karalexis’ nose that eventually stopped the fight. After getting back to his winning ways, Florian went on to take a fight with Muay Thai specialist Kit Cope where he defeated his opponent with a well executed rear naked choke submission early in the second round. Florian then fought Canadian TKO Lightweight champion Sam Stout at the UFC’s Ultimate Fighter season 3 finale. This time, it only took Florian 2 minutes in the first round to defeat the Canadian champion by rear naked choke submission, earning Kenny his first ever UFC Lightweight title shot. At UFC 64: Unstoppable, KenFlo took on UFC veteran Sean Sherk for the UFC Lightweight championship belt in October of 2006. Kenny looked good for most of the fight as he was able to cut Sherk a number of times with his vicious elbow strikes but Sherk proved to be too much for him to handle, as Sherk controlled Kenny for most of the fight and won a unanimous decision from the judges. The judges scored the bout 50-45 and 49-46 twice all in favor of Sherk, giving the Lightweight title belt to Sean Sherk. After roughly a half year of training and rest, Florian took a fight against Japanese fighter Dokonjonosuke Mishima on April 5, 2007 at UFC Fight Night 9. After breaking free from a brutal knee-bar attempt from his competitor late in fight, Kenny was able to get the victory after choking out Mishima with a strong rear naked choke submission with only a minute left in the last round. Shortly after his victory over the Japanese Mishima, Kenny fought again at UFC 73 on July 7, 2007. Kenny fought Alvin Robinson and defeated the newcomer by submission due to strikes late in the first round. During the first round, Florian brought Robinson to the mat where he worked his Jiu Jitsu skills and gained the mount position where KenFlo rained down punches until Robinson tapped from the strikes. Just two months after his victory over Robinson, Florian agreed to replace the injured Spencer Fisher, and fight against Din Thomas at UFC Fight Night 11. Early in the bout, Din Thomas injured his knee while attempting to shoot on Florian and as a result, Florian was able to take his back and finished Thomas with another rear naked choke submission with only 30 seconds left in the first round. Kenny Florian’s next fight would be in April of 2008 against Joe Lauzon at UFC Fight Night 13. Kenny dominated the entire fight and defeated Lauzon by TKO due to strikes early in the second round. In the first round, Joe Lauzon took Kenny to the mat where Kenny was able to land several elbows to the back of Lauzon’s head that cut him badly. The first round saw both fighters try to execute their game plan, with Kenny landing elbows and punches to Joe’s head and Joe trying for heel hooks and knee bar submissions. In the opening minute of round 2, KenFlo scored a takedown and rained down punches to Lauzon’s head until referee Herb Dean was forced to call the fight. On August 9, 2008 Kenny FLorian took a fight with the UFC veteran Roger Huerta, who was riding a 17 fight win streak, making Kenny a great underdog for the UFC 87 fight. Huerta was also known in the MMA world for having some of the best cardio of any fighter and too everyone’s surprise, Florian was able to not only last the full three rounds but KenFlo was able to defeat Huerta by unanimous decision, having all three judges score the bout 30- 27 in favor of Florian. Florian’s next match would be at UFC 91 in November of 2008 where Kenny defeated Joe Stevenson with his strongest submission, the rear naked choke. Florian choked Stevenson out with under a minute left in the first round after scoring a takedown and getting to the back of Stevenson where he slipped the vicious choke hold in to place and ended the fight. With his impressive victory over Roger Huerta and another against Joe Stevenson, Florian had established himself as the number one contender for B.J. Penn’s UFC Lightweight championship belt. Florian was quoted after his victory saying, “I want B.J.’s belt. B.J., you’re one of the best fighters out there. I’m here to test myself. I think you’re a great fighter, someone I look up to. I consider you a master. It’s time to kill that master.” Florian got his request and is scheduled to meet B.J. Penn in the ring at UFC 101 on August 8, 2009. Florian was chosen by UFC president Dana White to compete as a middleweight contestant on the first ever season of the Ultimate Fighter. Kenny accepted, and joined a very talented group of middleweight fighters including Diego Sanchez, Nate Quarry, Chris Leben, and Mike Swick. After winning his elimination round fights, Florian had made it to the Ultimate Fighter Season 1 finale where he would face off against Diego Sanchez. 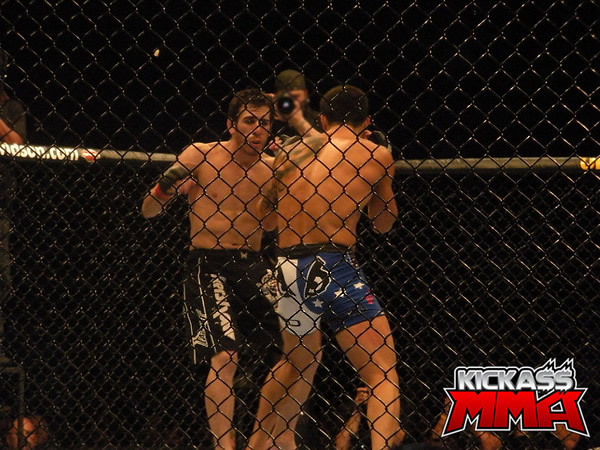 In their middleweight season finale bout, Diego Sanchez defeated Kenny Florian by TKO due to strikes 3 minutes into the first round. Kenny made his first appearance in a professional MMA fight in January of 2003 for the Mass Destruction 10 fighting event where he defeated his opponent Jason Giroux by technical knock out due to strikes just 7 seconds into the first round. Florian fought again at Mass Destruction 15 against Bobby McAndrews for his second ever appearance in the cage. Like his first fight, this one didn’t make it out of the first round as Kenny Florian defeated McAndrews just two minutes into the fight with a kimura submission. Following his two victories at the Mass Destruction fight promotions, Florian fought his third match ever for a new fight organization the Combat Zone. He fought an experienced MMA fighter and UFC regular Drew Fickett at the Combat Zone 7: Gravel Pit on July 10, 2004. Kenny had a great showing as he took the veteran Fickett the full 3 rounds and unfortunately lost the decision from the judges. This marked Kenny Florian’s first loss as a professional MMA fighter. Kenny was born on May 26, 1976 in Westwood, Massachusetts. He was the fourth child of six children born to his parents Agustin and Ines Florian. While Florian was born in the United States, he holds dual citizenship in the US and Peru. Florian was born to Peruvian parents however he is of Spanish, German, Armenian, and French descent. Florian attended high school in his home town in Massachusetts, and attended Boston College where he played division 1 soccer for the school’s varsity team. After college, he became more interested in mixed martial arts and gave up his soccer career to pursue different training for MMA. After graduating, Florian turned his attention toward Brazilian Jiu-Jitsu. Spurred on by his instructor, Roberto Maia, he entered open weight tournaments in order to test his skills. To Florian’s surprise, he was able to handily defeat bigger and more experienced fighters. Soon, he found himself training under some of the most accomplished Brazilian Jiu-Jitsu masters in the world. At the end of 2003, he was awarded a black belt in that fighting style, a rarity for Americans.In 2004, Florian met an MMA trainer named Mark DellaGrotte. This was his introduction to the combat style of Muay-Thai. Realizing that Brazilian Jiu-Jitsu alone would not be enough to become a major contender, he began mastering this new style of fighting. Kenny currently runs a show called ‘MMA Live’ for ESPN and is aired online. Kenny brings his MMA experience tp show as well as a good prospective from a current fighter in MMA. Florian also did some guest writing for an April 2009 edition of the MMA magazine FIGHT! Florian has also been a guest commentator for UFC 83 when he stepped in for Joe Rogan, and for a WEC 41 event when Florian stepped in for the absent Frank Mir. Kenny also made a guest appearance on the Dr. Phil show along side UFC president Dana White and UFC Light Heavyweight fighter Forrest Griffin. Florian, White, and Griffin were on the show to talk to teenage MMA wannabe fighters telling them how to properly train and not to get into fights at school. Aside from being a guest commentator and making various appearances to talk about MMA, Kenny also opened an MMA academy in Brookline, Massachusetts with his brother Keith, and a few other MMA training instructors. The camp teaches youth fighters Brazilian Jiu Jitsu, Muay Thai, wrestling, boxing and other mixed martial arts. One of Florian’s passions is being involved within his community. He speaks with middle school students about the importance of making the right decision. He has also visited American troops in Afghanistan, seeking to boost their morale and show his support. There’s more to Florian than mixed martial arts. But, given his fighting ability, he quiet manner, and focused determination, he’s one of the UFC’s rising stars.